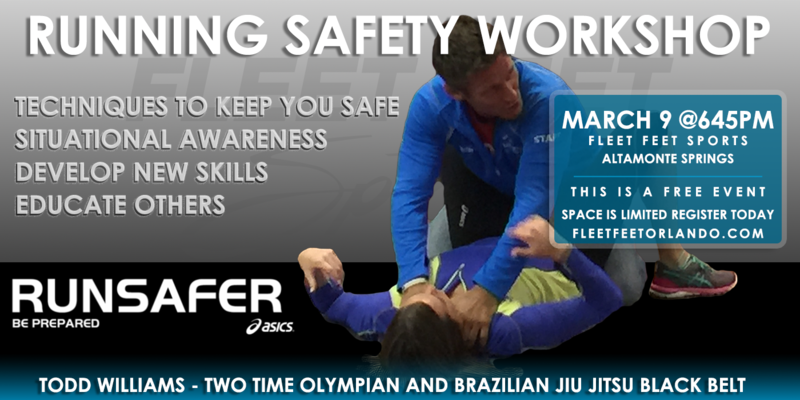 This program is conducted by two time Olympic distance runner and Brazilian Jiu Jitsu black belt Todd Williams. Time after time we read headlines about how individuals are assaulted or attacked while out on their run, being bullied at school or going to or coming back from their workout. Todd will use proven hands on self-defense methods designed for walkers, runners, and athletes. For the past 4 years and as a personal friend to Todd Williams. I have watched him take on a mission to educate all on the dangers of not being prepared and aware. He has created an incredible business using his passion and athletic skill. He spreads his message and techniques nation wide to all ages and anyone willing to listen and learn. These tips may be the difference in you becoming a statistic. Thanks to Asics for providing the funding to keep this workshop free for all of us. One attendee will win a pair of Asics shoes. You must be present during the clinic to win. We encourage you to share this event with your friends and family.